I took this unusual picture at a road stop in a rural town in Quebec. 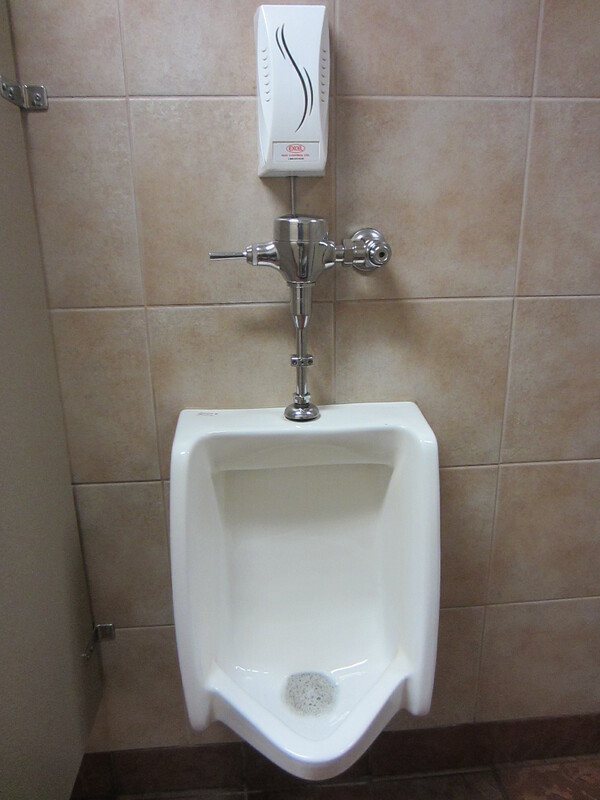 No one asked me if I wanted to get deodorizer sprayed in my face while I was standing at this urinal. However, people with multiple chemical sensitivity risk getting sick whenever they go into a public washroom because most bathroom facilities have deodorizers that spray toxic chemicals intermittently in order to cover unpleasant odours with other subjectively preferable scents. How about walking into a major department store? You can’t shop there without walking through the cosmetic and perfume section. Why are my patients forced to walk by a cocktail of scents when they enter many drug stores in order to fill the prescription that I wrote for them to control the symptoms that these kinds of exposures provoke? More than 40% of people who suffer from migraines report perfume as a trigger. Why do they have to risk a migraine just to obtain the medications which provide relief? If you’ve been to a department store, or used the facilities in a restaurant or public bathroom, you know what I’m talking about. It’s extremely difficult to go anywhere, or do anything without encountering fragrances. It’s not just perfume and cosmetics. It’s also cleaning supplies. And it isn’t just in public places, it’s also at your workplace and in people’s homes. What’s the matter with fragrances? Scented products contain up to 50 different chemicals, known as volatile organic compounds (VOCs). VOCs are also common outdoor air pollutants, released from burning fuel, such as gasoline, wood, coal or natural gas,. However, VOCs are actually found at higher levels indoors. They are released from solvents such as paints and glues, as well as air fresheners, paint thinners, hobby supplies, wood preservatives, automotive products, detergents, fabric softeners, cleaning supplies, degreasers and dry-cleaning fluids. Breathing low levels of VOCs for long periods of time can increase risk for developing health problems, such as asthma or sensitization to chemicals. Some are carcinogenic. There is an increasing awareness that we live in a polluted world. This has led to positive changes in the marketing of products. Almost every grocery store now offers organic foods because people want to buy them. You can now buy paints that emit only low levels of VOCs. Our behaviours drive the markets, but marketers also try to influence us to drive our behaviours towards purchasing their products. We can find substitutes for the more traditional scented cleaning products in the home, which claim to be safer and better for the environment. These products contain many substances, described as natural. They are too numerous to review here. But to make a point, I will mention one common substance found in many cleaning products – caprylyl/myristyl glucoside, which is a surfactant. Surfactants are necessary to help remove oils and grease found on your counters and clothing. They help oils mix with water. I never learned about this product in medical school, so I looked it up in the library of medicine. I found nothing. I found the Material Safety Data Sheet (MSDS) online and there appears to be nothing wrong with it. The online description is that it is plant derived, biodegradable and suitable for wastewater that we generate from sinks and bathtubs, and septic tanks. What I cannot find is what happens to this product when it enters the human body. For example, how do we get rid of it? Do we just urinate it or we have to detoxify and break it down first? How safe is it really? Perhaps it is just one more burden to our body’s detoxification system. Am I criticizing the use of natural products? Absolutely not. I am in favour of products that are biodegradable, and don’t harm the planet, especially if for now they appear to be safe for humans because there is no evidence that they are not. We need to wash our dishes, pots and pans, clean our toilets and bathtubs, wash our laundry, and dry it without static. So we need products which are effective. The problem is that there is no solid evidence that products claiming to be natural are safe either. We are relying on faulty logic, not science. Good logic will depend on how one defines natural. If it is defined as ‘not man-made’, then anything that normally exists on the planet is natural, including the mushrooms on your front lawn, mercury, lead, arsenic, petroleum and natural gas. In the context of environmental health, we should be defining natural in terms of safety for human exposure and consumption. Defining a substance as natural should consider whether the exposure has been common, and at levels consistent with what humans have experienced and naturally adapted to, for the last 10,000 years, since the birth of modern mankind. The detox system does not distinguish between natural and synthetic products; it uses what it can and rejects and eliminates the rest. Caprylyl/myristyl glucoside may be a natural product, because it exists naturally on the planet, but it is not expected to be found consistently in the human body. How much of a burden does it create along with so many other chemical exposures on our detoxification systems? For now, all we can do is avoid chemical pollutants and try our best to reduce the intake of all natural or artificial substances which are not necessary. Our hair does not need to smell like a bowl of fruit. Our clothes, sheets, and pillow cases do not need to smell ‘fresh’, as defined by scent companies. It does not matter whether the product is made in the laboratory or is extracted from flowers and trees. We are still filling our bodies with products which are not natural inside of us, and which our bodies try to expel. I’m not sensitive to fragrances, why should I change? We have detoxification systems inside every cell in order to remove waste products produced naturally by the by-products of maintaining life. When they cannot manage the burden of detoxification, damage occurs. Understand that these detoxification systems are less-than-perfect, and damage to cells is part of the normal process of aging, which eventually leads to malfunction of cells and organs, leading to disease and death. Burdening these detoxification systems further by putting products that are not natural inside of us contributes to that damage continuum as well. And the published evidence suggests that the VOCs are indeed a burden. Just because you can’t feel it happening doesn’t mean that changes are not occurring inside your cells, which can lead to a premature medical condition. I practice environmental medicine. I have seen more than 12,000 people who have been made sick by the environment from common exposures to every day pollutants, because their detoxification systems could not handle the burden. Most of these people are sensitive to chemical odors and have difficulty entering major department stores and some pharmacy chains. Even stores claiming to sell nothing but natural products provide the same barrier to entry when their scented merchandise is situated at the entrance. The ingredients may be defined as “natural” by some people, but the amount of exposure provided by these products is not normal for humans, and they need to be detoxified too. Who’s rights and who’s freedoms? There are no laws that protect people from toxic chemical exposures. Some hospitals or other public places have instituted no-scent policies, but it isn’t mandatory to do so. The fragrance industry is free to create products that can make people sick, while many of my patients have lost the freedom to shop, go to restaurants or movies, or even take long trips because bathroom breaks are an essential part of travelling. David Suzuki has toured across Canada to obtain public support to enshrine the right to a healthy environment into the Canadian Constitution. I think there should be a subsection to include the right to healthy shopping.